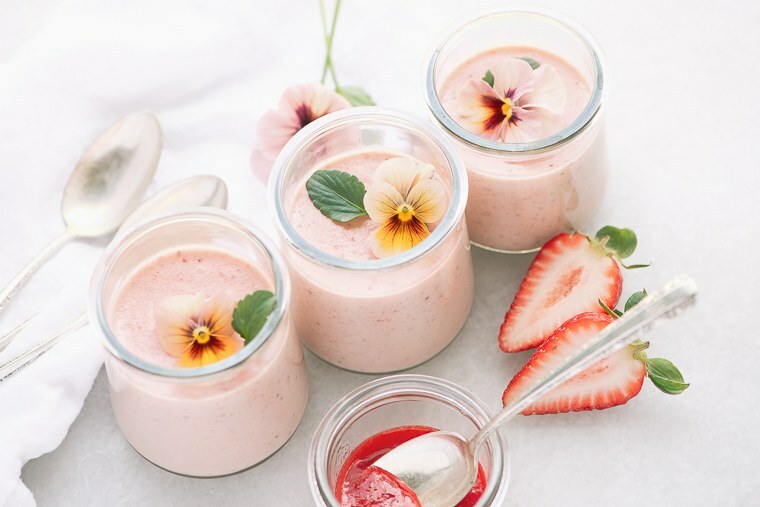 Puree the strawberries in a small food processor or good blender until smooth. Strain through a strainer and discard any seeds or solids. Stir in the lemon juice and set aside. Put the egg yolks in a medium bowl and lightly beat them. In a small heavy bottomed saucepan heat the cream and sugar, stirring to dissolve the sugar, until it comes to a simmer. Slowly drizzle half of the hot cream into the egg yolks, while whisking. Then pour that mixture back into the pan, stirring constantly, and bring back up to a gentle boil. Cook for about a minute, stirring constantly, as the mixture thickens. Remove from the heat and pour through a (rinsed out) strainer to remove any lumps. Measure out 1/2 cup of the strawberry puree and blend into the cream (reserve the rest of the puree to use as a sauce later.) Pour into 4 small jars or cups. Chill the pots for at least 4 hours or overnight. Served topped with the reserved strawberry puree, and a pretty edible flower!